My girls are all typically girlie. They love anything to do with hair, make up and beauty. 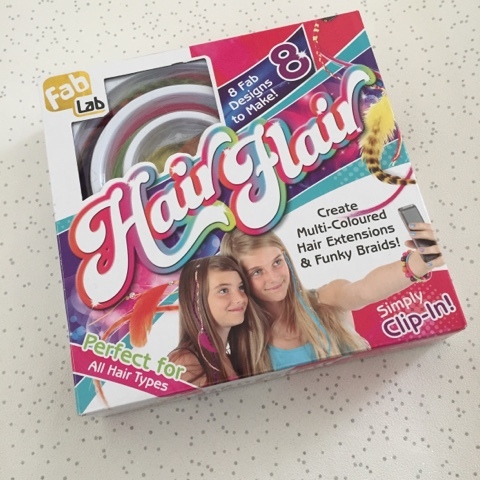 Already stealing my make up and accessories, my daughters are eager to get creative with their looks so when we were offered the chance to review FabLab's Hair Flair kit I was quick to say yes. 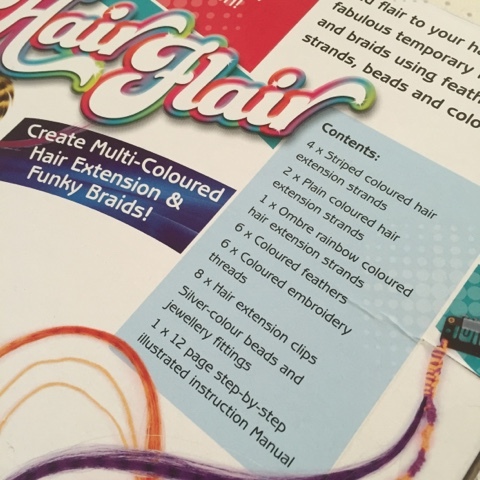 Hair Flair creates multi-coloured hair extension and braids that simply clip in making them suitable for any hair type. Allowing your kids to have fun and look trendy all at the same time. The instruction manual is very clearly laid out with both written instructions and pictures displayed making the process a simpler one. 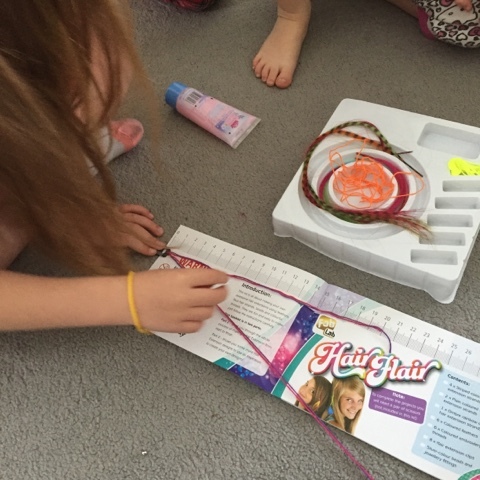 It does say on the box that this is more suitable for children aged 8 and above, this I agree with because although the process of making the braids is fairly simple it is also a tad fiddly so it does require patience. An added bonus is the ruler spread across two pages allowing you to quickly measure out your thread, this also makes a rather handy skill to learn if it isn't something you've done before as well. 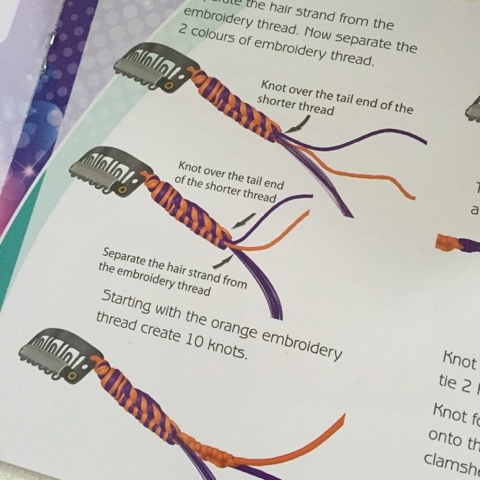 What makes the kit special is the fact that once you understand how to make the braids you can put together any combination of extensions, threads and feathers. 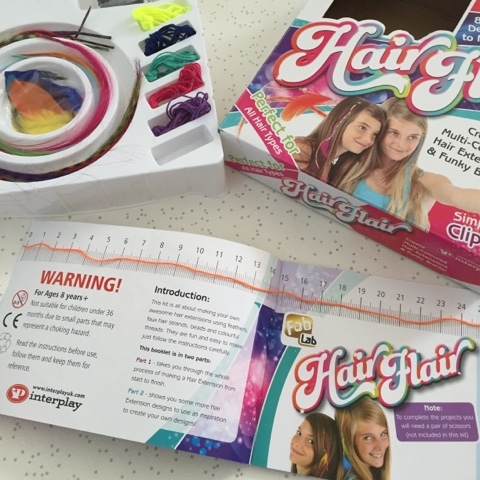 It allows your kids to create hair accessories which are unique to them. 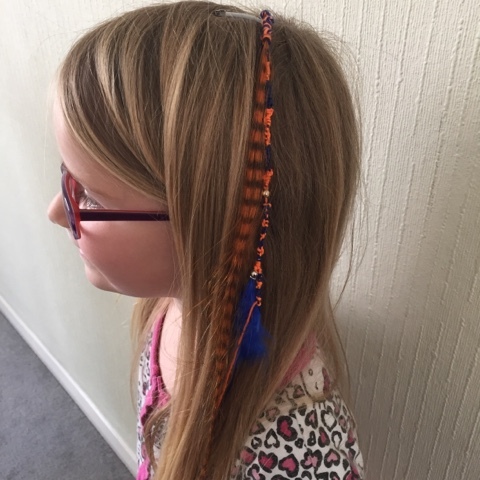 The finished hair extensions and braids add a pop of colour to your hair and are very easy to clip in and because they clip in and out there is no damage to your child's hair, one less worry for us as parents. 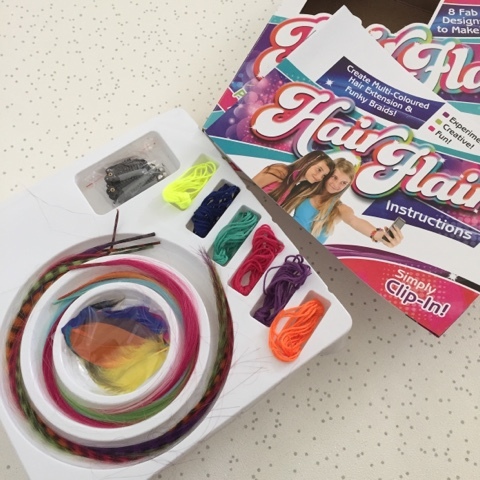 I found the Hair Flair kit to be quite beneficial to my eldest two as it allowed them to creative, show off a bit of independence making something for themselves and it demonstrated how they could concentrate on a task for a good amount of time when they really enjoy what they are doing. 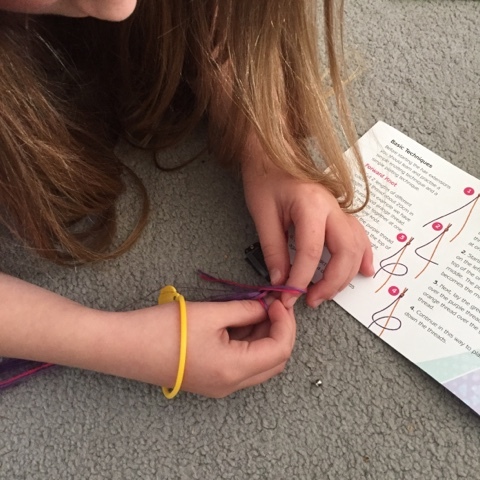 And as much as this kit is good for kids I have to admit that I had a go at making one myself, at the youngest kid's request of course, nothing to do with wanting to wear one myself ;) It became quite therapeutic braiding the strands together. Priced at £9.99 I think it is well worth the money you pay. What's included in the kit allows you to make up to 8 hair extensions/braids and gives you the knowledge to make more should you decided to go and buy extra equipment yourself after.